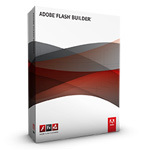 Flash Builder 4.7 is a complimentary update from version 4.5. Flash Builder 4.5 customers can download the trial version of Flash Builder 4.7 and request a Flash Builder 4.7 serial key. † The following distributions are supported: Eclipse IDE for Java EE developers, Eclipse IDE for Java developers, Eclipse Classic, and Eclipse for PHP developers. Skip the shipping and save money. Choose the Electronic Software Delivery (ESD) option when you purchase and start downloading your new software in minutes (see chart below). 1.1 GB * 1 hrs. 36 min. 49 min. 15 min. * A high-speed internet connection is required.